Mayor Hazel McCallion, whose tireless optimism has earned her the nickname ‘Hurricane Hazel’, has cultivated a reputation for her skill at governing, shown by Mississauga’s dynamic evolution into one of Canada’s most successful cities. During her over 40 years of public service, she has led the transformation of a few small towns into the sixth largest city in Canada, and at 84 years of age she symbolizes the vitality of her city. Not only is she locally revered, she is an international ambassador for the city and a world citizen. She has been appointed to and served on numerous committees, and as a local leader she has used her expertise and influence to effect changes at home and abroad. Mayor McCallion’s support of her community and beyond includes her membership on the Advisory Board of the World Health Organization's Kobe Centre, Cities and Health Programme in Kobe, Japan. This involvement has led her to establish a partnership with the University of Toronto at Mississauga to create a “Healthy City” made-in-Mississauga model that focuses on longitudinal studies on inputs and outcomes which relate to measures used in creating healthier citizens and critical intervention efforts. She is honorary chair of the Healthy City Stewardship Centre, aimed at creating this health development plan for Mississauga. Mississauga is one of only a few Canadian cities that will be highlighted at the 2005 World Expo in Japan. Mayor McCallion has nurtured Mississauga’s sister-city relationship with Kariya, Japan for 24 years. As a result of a recent trip to Tanzania, Mayor McCallion was determined to reach out to support the victims of HIV/AIDS in that country. She launched “Hazel’s Hope” when she delivered the keynote address at Mississauga’s “Women of Courage” Luncheon series and encouraged everyone to donate “one toonie” (two dollars) to support this cause. To date, almost half a million dollars has been raised through World Vision to support children and families in Tanzania. In December 2004, Mayor McCallion also called on residents to help tsunami victims in southern Asia through donations made at her annual New Year’s Day Levee. Mayor McCallion’s efforts and accomplishments have been lauded with an outstanding number of awards. In 2003, she received the Award for Leadership in Public Service from the US-based International Economic Development Council. In 2004, she received the Outstanding Achievement Award from the Greater Toronto Marketing Alliance for her leadership in bringing together the 30 mayors and regional chairs of the Greater Toronto Area for the economic benefit of the entire region. In 2005, her long standing service to her municipality was recognized by the province of Ontario. She has been chosen as one of the American Women of the Year, in Who’s Who of American Women (referring to North American women) and holds Germany’s highest individual honour, the Cross of the Order of Merit of the Federal Republic of Germany. Mayor McCallion is committed to creating a safe and healthy environment for her citizens. In 2004, Mississauga was rated the “safest city in Canada” by the Mississauga Crime Prevention Association as compared to cities similar in size for the fourth year in a row. The Mayor continues to support the City’s highly successful anti-idling program and an anti-litter campaign aimed at community participation and education. By 2005, the anti-litter program had been endorsed by 31 municipalities in Ontario, each one following the tenets of Mississauga’s campaign. In 2004, Mississauga residents gave Hazel McCallion a 94 per cent approval rating in a comprehensive survey conducted by the Environics Research Group. Elected for a tenth term of office in 2003 with 92 per cent of the vote, Mayor McCallion’s Inaugural Speech clearly outlined her priorities for the next three years. She advocates a new deal for municipalities, one that supports a strong sustainable future and permits local governments to control their own destiny. As a result of her pay-as-you-go philosophy and running the city like a business, Mississauga is debt-free with a strong economy. For the second straight year, her City has been assigned Standard & Poor’s Ratings Services’ AAA credit rating, ahead of its domestic and international peers. Mayor McCallion’s current role as Chair of the Large Urban Mayors’ Caucus of Ontario (LUMCO) gives her the opportunity to raise municipal issues and concerns to both the provincial and federal government. In part, through her efforts, a historic new partnership between Ontario cities and the federal government was sealed this year, earmarking $1.9 billion in gas tax money for Ontario city buses, subways, sewer and water systems and bridges. Her goal to give Mississauga greater political representation at the Region of Peel (upper tier government) was realized in 2005 when the Ontario government enacted a new law to give her City two additional seats on Regional Council. This gave Mississauga 50 per cent of the voting power on Peel Council for the first time since the Region was formed in 1974. Her long-term goal is for Mississauga to become a stand-alone municipality which would allow the City to be a one stop shop for citizen service delivery and keep its property tax dollars for local priorities. According to an independent consultant, it has been confirmed that Mississauga taxpayers pay as much as $32 million every year to deliver services from two levels of government, and Mayor McCallion is determined that her citizens receive the right services, delivered in a superior way, at a reasonable cost. The Mayor also supports “smart growth,” that is, the planned development of communities whereby urban sprawl is contained and growth is managed. Her leadership as Chair of the Province of Ontario’s Central Ontario Smart Growth Panel supports her priority for the creation of a coordinating body to bring consistent policy direction to the development of the Greater Toronto Area (GTA), of which Mississauga is a part. A key goal is to have the government endorse overall development principles that include land use planning and infrastructure planning. On transportation issues, Mayor McCallion advocates a coordinated GTA-wide approach to solving the transportation and gridlock issues. One success recorded in 2004 was the creation of dedicated bus lanes to allow transit buses the right-of-way on the paved shoulder of a major expressway. The Mayor is also a big supporter for trails, linear linkages and a strong bicycling committee to encourage citizens to walk or cycle around the city. On the technology front, the City is moving forward on a very ambitious plan to bring a number of City services to citizens via the Web, 24 hours a day, seven days a week. Launched in late 2003, eCity, the City’s web portal, supports a wide variety of services such as scheduling building inspections, buying tax certificates and viewing tax assessment information. Citizens are able to go online to apply for jobs, register for recreational programs, obtain transit maps and pay for fines. As the City enters its final phase of green-field development, growth will begin to slow, as will the source of new revenues from new assessment. Following a year-long process, City staff inventoried more than 200 municipal services, defined service levels and presented recommendations related to cost reduction and service level adjustments. This review under the leadership of the Mayor reflects her operating philosophy based on managing the City’s funds as judiciously as her own and maintaining the City’s debt-free status where citizens enjoy one of the lowest tax rates in the GTA (Greater Toronto Area). She has worked hard to develop a city with strong communities, a wide selection of housing, shopping and great schools. There is an active cultural life with galleries, theatres, art centres, concert halls and museums. Citizens enjoy many public recreation and sports facilities including swimming pools, ice rinks, arenas, libraries, fitness centres, golf courses, community centres and a marina. The Mayor supports a variety of cultural events including Carassauga, which showcases pavilions representing Mississauga’s diverse community. Now in its 20th year, the three-day event showcases 19 different countries. In 2005, she established the Mississauga Arts Review Taskforce, which will review the future sustainability of arts organizations and activities in Mississauga. Furthermore, the Hazel McCallion Academic Learning Centre is slated to open in 2006. This new, innovative facility at the University of Toronto at Mississauga was named after the Mayor in recognition of her enthusiastic support of this educational institution. Encompassing qualities quintessential to a true role model, it has been said that no politician in Canada is so closely associated with his or her community; Hazel is Mississauga. On 11 November 2003, Hazel McCallion started her 10th term as Mayor of Mississauga, Ontario. She was first elected Mayor of Mississauga in November, 1978, and is the longest serving Mayor in the city's history. She was acclaimed in 1980, re-elected in 1982 and 1985, acclaimed again in 1988 and re-elected in 1991, 1994, 1997, 2000 and 2003. 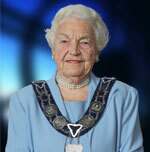 Mayor McCallion was born in Port Daniel on the Gaspe Coast of Quebec, and educated in Quebec City and Montreal. She then began a career with Canadian Kellogg, and remained with the company for 19 years. In 1967 she decided to leave the corporate world and devote her career to politics. She was elected Chairman of the Streetsville Planning Board that year, and again in 1968. Later that same year, she became Deputy Reeve of Streetsville. She was later appointed Reeve, then elected Mayor of Streetsville in 1970, serving until December, 1973. 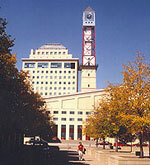 When the Region of Peel was established in 1974, Ms McCallion was elected to the Mississauga and Peel Regional Councils. She served two terms as a Councillor prior to her mayoral campaign in 1978. By the time she was elected Mayor, she had sat on virtually every committee at the Region of Peel and the City of Mississauga. She has also served on the executive of many federal and provincial committees and associations. In 1991, Mayor McCallion became the first mayor of a major municipality to submit the annual operating budget to residents for their input and scrutiny. She is also among the first mayors of major municipalities to be openly committed to a pay-as-you-go philosophy. The city has not had to borrow money since 1978, and is currently debt-free. Mayor McCallion also established the Greater Toronto Area (GTA) Mayors' Committee in 1992. She brought together the 30 GTA mayors, later adding the Chair of Metro Toronto and the four Regional Chairs to work co-operatively for the economic recovery of the GTA. From 1992 to January 2000, the Committee, chaired by Mayor McCallion, was a strong voice on key issues affecting the future of the GTA. As part of that effort, she is also Honorary Co-chair of the Greater Toronto Marketing Alliance. In 1996, Mayor McCallion was appointed to the Who Does What Panel established by the province to review the delivery and funding of government services. In February 2002, Mayor McCallion was appointed Chair of the Central Ontario Smart Growth Panel. The panel, made up of 22 local government officials and business leaders, is advising the provincial government on how to plan for growth for the central region in both the short and long terms. In addition to the pressing issue of growth, the panel is looking at other issues, including gridlock and waste disposal. The panel, the largest in the province, extends from Niagara to Port Hope and Orillia, and includes the Regions of Niagara, Waterloo, Halton, Peel, York and Durham, as well as the City of Toronto. Mayor McCallion has played a leading role for women in politics. She is the first woman to hold such significant positions as President of the Streetsville and District Chamber of Commerce; President of the Anglican Young Peoples' Association of Canada; Mayor of Streetsville and Mayor of Mississauga. She was chosen one of the American Women of the Year in Who's Who of American Women (which refers to North American women). Mayor McCallion also holds Germany's highest individual honour, the Cross of the Order of Merit of the Federal Republic of Germany, for her role in bringing German companies to Canada.